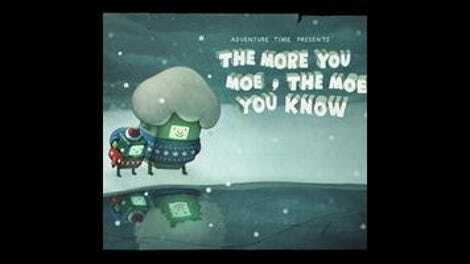 "The More You Moe, The Moe You Know"
As Adventure Time has evolved, it’s done remarkable work balancing childish visuals and plots with mature themes and metaphors, and “The More You Moe, The Moe You Know” is a strong example of this dynamic. BMO, a product created to bring enjoyment to children, grows up in this episode written and storyboarded by Tom Herpich and Steve Wolfhard, who ask serious questions about the nature of love and what it means to get older while taking BMO on a colorful, video-game inspired adventure. It’s an exceptional holiday two-parter, rich with philosophical musings, complex emotions, and visual splendor that keeps the episode from becoming too dour. BMO’s maturation begins when Moe, BMO’s creator introduced back in “Be More,” shows up at Finn and Jake’s tree house with a new body and a special solo mission for BMO, sending him to the MO factory so that he can finally grow up. BMO has complicated feelings regarding this forced exit from childhood, and when he thinks of the pros of getting older, these advantages are framed through the context of a kid’s interests. When BMO is old, he’ll be able to drive himself to the playground and he’ll be able to buy his own pacifiers. This moment reminds me my favorite song from Matilda The Musical, “When I Grow Up,” a bittersweet tune about the idealistic views of adulthood children have. It’s an especially tragic song to listen to as an adult that knows how wrong these expectations are, and BMO doesn’t realize that the playground and pacifiers likely aren’t going to interest him when he gets older. The cons of growing up are much heavier, and BMO wonders if Finn and Jake will still love him. Will he still love them? “Does growing up just change your body, or also your soul?” BMO asks the air, which he views as an actual conversation partner because he has the active imagination of a small child. “Maybe I could just stay the same forever.” Over the course of this episode, BMO learns that he can’t. When he gets to the MO factory, he finds a building that has been destroyed and covered in snow, and the ominous music reinforces that things are about to go very wrong for BMO. When he stands on a hastily drawn X to start his mission, the floor drops out from beneath him and he sent tumbling down toward the factory’s trash compactor. BMO narrowly escapes getting crushed, but then he encounters a series of platform game-inspired obstacles that he has to bypass to survive. It’s very clever to have a living video game overcome challenges pulled from a genre that was especially popular during the medium’s early days, and as the episode progresses, BMO’s challenges start to evolve. At the end of this first round of obstacles, BMO gets his foot stuck in a piece of pneumatic machinery, giving him some more time to ponder his transition. “Maybe the lesson is that when you are grown, you won’t ever be able to tell if everything is going totally haywire, or maybe if truly everything is perfectly fine,” he says, offering some deep insight into the uncertainty of being an adult, and the fact that he’s asking these questions indicates that BMO is already starting to mature mentally. Once his foot gets loose, BMO falls into the room where all the factory’s waste is stored, where he finds ALLMO, a giant cube made up of the fused consciousnesses of all the MOs that recently somersaulted to their deaths after a virus breached the factory’s firewall and commanded the MOs to throw themselves in the trash compactor. The platform elements are replaced by a puzzle challenge as BMO puts pieces of MO bodies together to create a tower big enough to get him into the vent at the top of the room, and once he’s in the air chute, he enters a horror point-in-click game as he discovers the creepy room of AMO, the very first MO. As ALLMO tells BMO, AMO was built to receive love, but couldn’t think outside of his programming and was blinded by his need. “Such is the cruel physics of love,” ALLMO says, “that those who crave it most will repel it, and only the dang rich get richer.” Desperate for love that he never received from his maker, who abandoned him after creating more sophisticated models, AMO developed a hateful personality that made him unlovable, motivating him to act cruelly in a twisted attempt to gain affection. AMO left the factory for a long time and learned terrible things about himself, and when he returned, he put in action a plan to make his creator pay for his suffering and steal BMO’s loving family. 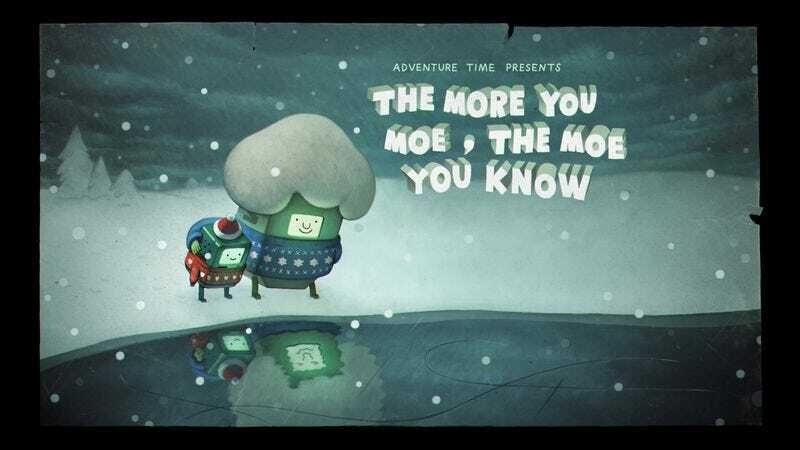 After finding the dying Moe, AMO took the man’s memory backup drive and used it to find a way to kill off the other MOs, and then AMO pretended to be Moe so that he could send BMO on a suicide mission. AMO has been irreparably morphed by his childhood trauma, and BMO won’t let him get away with his evil actions. While all this is happening, Finn and Jake are forced to hang out with Moe/AMO, who is needy, selfish, and really boring. He tries to act like BMO by suggesting they all go out and play in the snow, but when he gets hit in the head by Finn and Jake sledding on a rolling chair, he throws a temper tantrum and demands that they go back inside and do what he wants to do. And because he’s old, what he wants to do is look at coupons in the newspaper. Finn and Jack aren’t enthused by this, so Moe lets them play the one game programmed into his body: the archaic Hangman. The Hangman scene is a comedy highlight of the episode, especially Finn and Jake’s frustration when they find out the answer is “Burgess Meredith,” a hilariously dated reference to the actor/director/writer/producer that was prolific in Hollywood for more than 60 years. BMO is extremely confused and needs some time to sort out all these thoughts in his head, but he makes some significant progress in reclaiming his spirit by the conclusion of the story. Conflicting thoughts swirl around BMO’s head in a great representation of the intense anxiety and fear that often come with adulthood, but he’s able to put them to rest by remembering what makes him different and special. His creator may be gone, but BMO still has the imagination he was born with, and he just needs to believe in the power of that imagination to take him into an adulthood that doesn’t sacrifice all the things he loved about being a kid. “If I cannot trust in Moe, I can trust in me,” BMO says to himself, having finally learned that one of the most important parts of growing up is staying true to the person you are deep inside. Apologies on the lateness of this review. That was a scheduling mix-up on my part. Niki Yang does phenomenal work capturing all of BMO’s emotions in this episode, and the youthful quality of her voice emphasizes BMO’s desire to stay a child, even as his thoughts become more mature. It gives a very strong impression of a person that is struggling to hold on to his youth in the face of age’s unstoppable influence. I really love the colors in this episode: the bright rainbow coloring of the brief scene in the Candy Kingdom, the muted palette of BMO’s journey to the factory, the bold red of AMO’s room. The colors in the final scene are especially effective, with the contrast of warm and cold shades during the sunset evoking the internal conflict brewing inside BMO, as do the different colors of each of BMO’s different thoughts. Hangman was one of my primary tools for passing time in high school classes I hated. I remember “Rhythm” being a really great word to use. NEPTR has started to rap. I wouldn’t mind an episode about NEPTR’s aspiring rapper career.